Damage changed fromÂ 50/80/110/140/170 [+0.4 Total AD] to 60/90/120/150/180 [+0.2 Total AD] (revert on the change in this PBE update). Base Damage decreasedÂ from 40/65/90/115/140Â to 35/55/75/95/115. Hey everyone! Paul â€œPartiestCatâ€ Jarvis here. I was in charge of driving the style and direction for how Poppy moves and wanted to give you all a little behind-the-scenes look on how we approached the animation for Demaciaâ€™s tiniest hammer delivery service. Okay, quick animation history lesson. Thereâ€™s a set of animation principles that most animators follow that dictate and drive the choices we make when building out the motion for characters and they cover topics like posing, exaggeration, and visual/emotional appeal. One principle in particular — squash and stretch â€“ is something weâ€™ve adapted as a fundamental aspect to Leagueâ€™s in-house animation style. Broadly speaking, squash and stretch helps a character feel organic and alive. Itâ€™s used to emphasise weight, momentum, and speed of objects by warping and distorting their shape. When we use more extreme versions of these distortions to connect our most important â€œkeyâ€ poses, we call them smears or â€œsmear frames;â€ single distorted frames between broad actions. Using smears helps to sell impacts on spells, attacks, or any super-quick motion. A championâ€™s animation needs to feel awesome in fractions of seconds, and smears help by adding texture and flavor between exaggerated motions. Yordles are squishy. I donâ€™t mean that literally, but their short stature gives them lots of wiggle room for us to exaggerate how they move. Poppy has a tiny frame, so itâ€™s also important that we can make her motion broad enough to not be hidden under her big Yordle head. Ideally, she should never LOOK like sheâ€™s made of rubber, but her motions should have a certain extra snap to them to keep her feeling energetic and punchy. We kept the same mindset with the motion of her hammer, but Iâ€™ll get to that below. Historically, League isnâ€™t the kind of game that normally needs facial animation. The camera angle and distance from your champion normally means a characterâ€™s face only takes up a handful of pixels on-screen at any moment and extra detail actually makes it harder to understand what is happening. As animators, we wanted to challenge that idea, and our early tests actually showed us that her expression changes were fully readable and felt like they added a lot to her personality. The first thing I did with Poppy was to carve out a set of base expressions to feel out her emotional range, and then develop them until that we all felt confident about the direction. Once we had a solid foundation, we were able to focus on the expressive timing â€“ finding punctuated moments during and after her abilities and attacks where the expressions could be clearly seen. When you only have a fraction of a second to sell an attack, communicatingÂ a clear change in mood is really important. Poppyâ€™s hammer is just as important as she is and we really wanted to reflect that in her animations. Why not give her hammer the same degree of personality that we give to the Yordle that wields it? We spent some time going back and forth about what kind of shapes we needed the hammer to make, which parts we wanted to push and pull, and which parts needed to twist, distort, or grow and shrink. Squashing, stretching, and smearing is just as important for the hammer as it is for Poppy, so we needed to crank it up to 11. The head of the hammer scales to cartoonish sizes for single frames so you can really feel the force behind the swing, and the neck of the hammer bends to compensate. With a little sorcery and a lot of clever rigging we were able to build really clean smear trails for the hammer that gave us a nice, stylised alternative to motion blur. Itâ€™s a more traditional animation method that meshed really well with how we normally animate our champions. Lastly, take a look at the most extreme case that brings everything together: the swing of her fully-charged Keeperâ€™s Verdict. Thatâ€™s about it! Weâ€™re always looking for new ways to improve champion experiences and bring out the best in every single rework we do. The whole team is extremely excited and proud to see Poppy out in the world, and hope you enjoy playing her as much as we enjoyed making her! After questing all across the PBE, Poppyâ€™s ready to bring her updated story, visuals, and gameplay to live. One of the largest champion updates since Sion, Poppyâ€™s gameplay changes hammer home her role as a tanky teamfight disruptor capable of crushing even the best laid plans with a well-timed mallet smash. With new visuals that bring all of her models up to todayâ€™s standards, Poppyâ€™s also the first champion update to include new splashes for each of her skins. Check out Poppyâ€™s PBE debut articleÂ for the full gameplay changes and learn even more from her champion update Q&A. Lollipoppy, Ragdoll Poppy, Blacksmith Poppy, and Noxus Poppy are also available separately in the store through January 11 as a special promotion for Poppyâ€™s champion update. 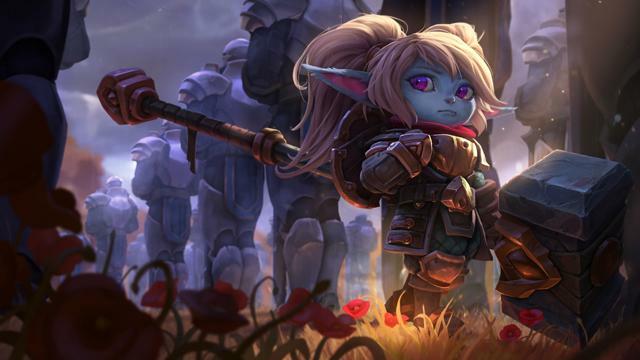 Poppy’s received a complete visual & gameplay update. There’s no “Traditional” skin for her, meaning if you have her currently, she’ll be completely replaced with her new looks in Patch 5.24. Poppy’s basic attack throws her buckler, gaining 400 basic attack range and dealing 10 [+ 10*Champion Level] bonus magic damage. The buckler lands at a nearby location and Poppy can pick it up to gain a shield for 15% of her Maximum Health for 5 seconds. Enemies can step on the buckler to destroy it. The buckler automatically returns to Poppy if the attack kills the target. Poppy smashes the ground, dealing 30/65/100/135/170 [+0.7 Bonus AD] [+ 6% of target’s Max HP] as physical damage, and leaving an unstable area. The area slows enemies inside it by 20/25/30/35/40% and erupts after 1 second, dealing the same damage again. DamageÂ is reduced by 20% against minions. Passive: Poppy gains bonus [12% of current Armor] Armor and [12% of current MR] Magic Resist. This bonus is doubled if Poppy is below 40% Max Health. Active:Â For the next 2.5 seconds, Poppy gains 27/29/31/33/35% bonus Movement Speed. While Steadfast Presence is active, she stops enemy dashes in an area around her, dealing 70/110/150/190/230 [+0.7 AP] to targets who have their dash blocked. Poppy rushes to target enemy, dealing 50/70/90/110/130 [+0.5 Bonus AD] physical damage and carrying them forward. If Poppy’s target hits terrain, it takes the same damage again and isÂ stunned for 1.6/1.7/1.8/1.9/2 seconds. First Cast: Poppy channels for up to 4 seconds, decreasing her Movement Speed by 15%. If Poppy doesn’t recast the spell within the 4 second period, the cooldown of the spell is decreased by 75%. Second Cast: Poppy smashes the ground and sends a shockwave forward that deals 200/300/400 [+0.9 Bonus AD] physical damage and knocks enemy Champions hit a large distance towardÂ their Summoning Platform. The shockwave length and knockback distance increase with channel duration.Â Enemies are untargetable while they are being knocked away. Runeterra has no shortage of valiant champions, but few are as tenacious as Poppy. Bearing a hammer twice the length of her body, this determined yordle has spent untold years searching for the â€Hero of Demacia,â€ a fabled warrior said to be the rightful wielder of her weapon.